Again, I am behind in posting (and photographing) models. 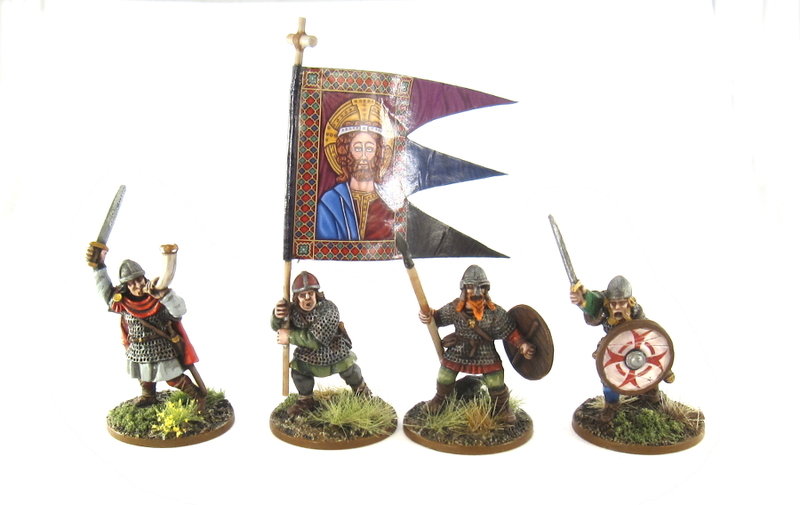 I have now completed the rest of the Anglo-Saxon Warband with the addition of two units of Hearthguard and a generic Warlord. I will be painting some of the special leaders later, as well as adding a generic pool of peasants from which different warbands can draw their levy contingent. The models are a mix of metal and plastic as usual. At the very bottom are some fatigue markers using the wooden dial bases that I use for other games (not sure how useful it will be as the dials go from 1 to 12 which seems overkill for SAGA – I might replace them with simple “chip” style fatigue markers later). Well, I my have gotten carried away a bit again. “Making a few SAGA warbands” turned into “Buy the entire Gripping Beast line-up plus all available plastic boxes from all manufacturers”. So the last couple of months were devoted to cleaning up models, basing everything and generally breathing in lots of metal dust. But that’s done and finally it is time to paint. I give you my first step into the world of SAGA: three units of Anglo-Saxon Ceorls! Pretty standard models – a mix of plastic and Gripping Beast metal models thrown in for variety.